The House intelligence committee has referred 17 current and former Department of Justice and FBI officials to testify before Congress in connection with the ongoing investigation into abuses of the Foreign Intelligence Surveillance Act (FISA) related to spying on the Trump campaign. The committee itself does not have direct oversight over the FBI and DOJ, and so committee chairman Rep. Devin Nunes (R-Calif.) referred the names to the Committee on Oversight and Government Reform and the Committee on the Judiciary, which do have oversight, because the FBI and DOJ officials “may have relevant information” for the investigation. Nunes’s committee is currently investigating the circumstances surrounding the FISA warrant that was used to spy on Trump campaign volunteer Carter Page and by extension other members of the Trump campaign. “During this investigation, the committee discovered matters that likely fall within the purview of the joint task force of the Committees on Oversight & Government Reform and the Judiciary that is conducting ongoing oversight related to FBI and DOJ,” Nunes wrote to the committees’ respective chairs, Rep. Trey Gowdy (R-S.C.) and Rep. Bob Goodlatte (R-Va.), in a June 29 letter that was first obtained by Fox News. Among the officials sought for questioning is FBI agent Peter Strzok, the lead agent on the FBI’s investigation into alleged collusion between the Trump campaign and the Russian government. Text messages obtained by the DOJ inspector general revealed that Strzok said he would “stop” Trump from becoming president and that an “insurance policy” was needed to prevent this from happening. Strzok went on to serve on the team of special counsel Robert Mueller before being demoted. He is currently the subject of an internal FBI investigation. Another official sought for questioning is Bruce Ohr, who served as an associate deputy attorney general during the 2016 election. Ohr had met in secret with a co-founder of Fusion GPS, Glenn Simpson. Fusion GPS had been hired by the Clinton campaign and the Democratic National Committee to produce the so-called “Trump dossier,” which would become the basis of the narrative that Trump colluded with Russia. Ohr’s wife, Nellie Ohr, had been hired by Fusion GPS to work on the controversial dossier. Also sought for questioning is FBI agent Joseph Pientka, who together with Strzok interviewed Trump’s national security adviser, Michael Flynn. Pientka could shed light on claims by lawmakers that the FBI’s record on the interview with Flynn was altered. Former Deputy FBI Director Andrew McCabe is also among those referred for testimony. Nunes called for the potential testimonies to be shown to the public. 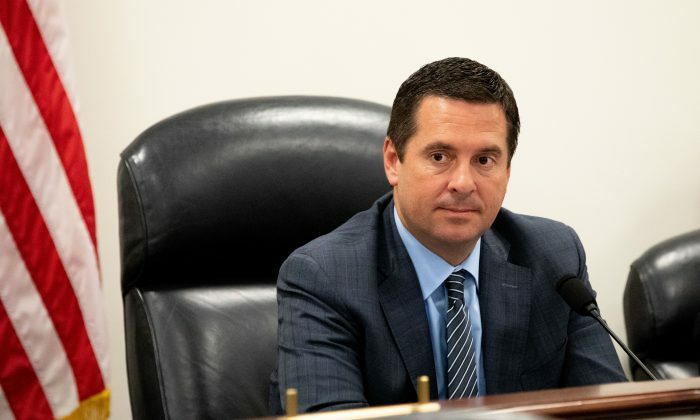 “For the sake of transparency and to keep the American people as fully informed as possible about these matters, the task force should consider interviewing these individuals in an open setting,” Nunes wrote. Last week, the House passed a resolution demanding that the Justice Department hand over documents related to potential abuses of FISA. So far, the DOJ has refused to hand over all relevant documents, despite several subpoenas and multiple requests over the course of more than a year. The key claims of the controversial dossier, which relies on questionable sources, remain uncorroborated. In its FISA application to the Foreign Intelligence Surveillance Court (FISC), the DOJ and FBI did not inform the court of the origin of its claims, nor that the information had been paid for by political actors. FISA warrants are among the most intrusive possible, allowing agencies to capture all of a person’s communications. Under the so-called two-hop rule, anyone within two degrees of separation could be spied on as well. This means that most members of the Trump campaign, including Donald Trump himself and his family, could have been spied on.